I can see why this dish has it's fans. The chicken had a richly flavored cilantro sauce. A little salty for my taste, but delicious nonetheless. 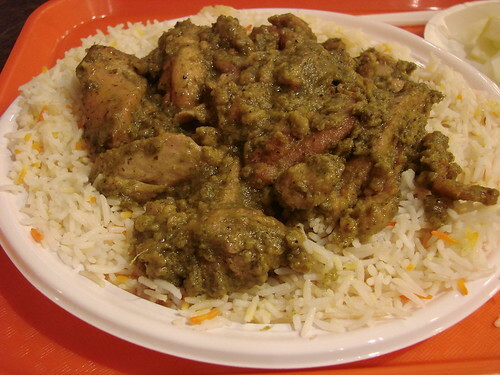 Menupages has a number of reviews that remark on the small portions, but I've never left Minar hungry. Between the two of us Blondie and I shared the Cilantro Chicken and a Vegetarian Combo both over rice and we added in a side of naan. Tons of food, we definitely couldn't finish it all. Minar has lots of tasty options, it's worth it to enlist a companion for a Minar outing so you can try a few things on the menu. 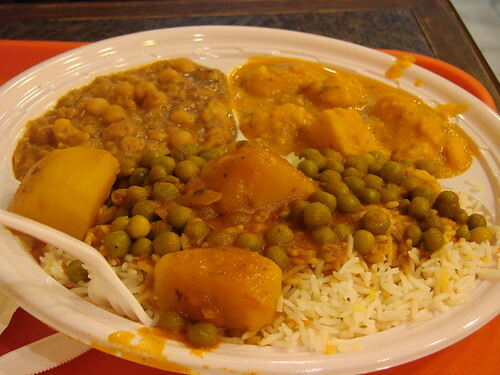 Their chana (chickpea) curry is always good as is the Dum Aloo, Friday potato curry special. Mmm. Anything that has cilantro in it immediately attracts my attention, but the chicken looks pretty great too hah! I'll have to check it out.